Brian O’Connell from The Irish Times wrote an article on restoring listed buildings for the Weekend Review Supplement. Buying a listed building and restoring it as a home could seem like an ideal enterprise to many people, but the reality is they need massive amounts of time, effort and help, writes Brian O’Connell. For many property romantics, the dream of owning a listed building can quickly turn into a financial and logistical nightmare. To borrow from the novelist, listed buildings are becoming something everyone wants to have bought, but nobody really wants to buy. Take Chris Deakin for example. A few years back, Chris and his partner, Orla McCluskey, stumbled across their dream home in the property pages of a newspaper. 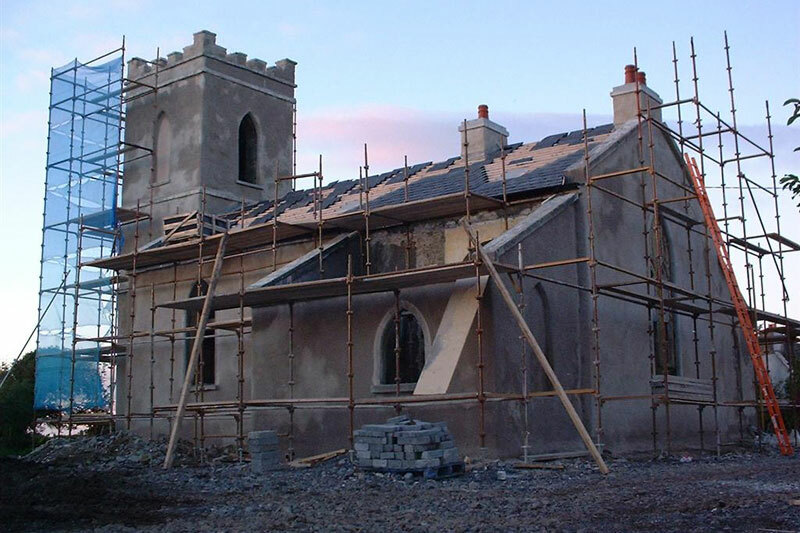 The building, an old disused church in the Galway countryside, had never been lived in and caught the couple’s imagination. Up to that point the couple had lived in a 1970s bungalow, which they extensively refurbished. The decorating bug well and truly bit, and they set their sights on the 200-year-old building 7 miles from Athenry. Strictly speaking, listed properties, or protected structures as the Heritage Council refers to them, are structures which a planning authority considers to be of special interest from an architectural, historical, archaeological, artistic, cultural, scientific, social, or technical point of view. Every planning authority in the country is required to keep an inventory of listed buildings, or Record of Protected Structures (RPS). Any member of the public can recommend a building for protection, but the decision to include structures in the RPS can only be made by the elected members of the planning authority. Owners of protected buildings are under certain obligations to ensure no aspect of them is endangered through harm, decay or damage. If you are considering carrying out refurbishments to one, then more stringent planning laws apply which planning authorities can advise you about. It’s worth checking what redevelopments will be allowed on your property with the planning authority before you buy, as certain works that are normally considered exempted development may require planning permission on a protected structure. COLM MURRAY, architecture officer with the Heritage Council, knows first hand the challenges involved in buying a listed building. Five years ago, he bought an early 20th century arts and crafts style property in Kilkenny and carried out extensive renovations. “We didn’t have any real problems with the building, but then again as an architect I could apply my own expertise. There were some silly legal issues to do with the estate which delayed the sale by a year, but that gave us time to think about how we were going to upgrade the property. It’s worth bearing in mind that when you buy a protected building, your solicitor should flag the protected status. You shouldn’t be buying a house and discovering after the sale that it has a protected status – that should be avoided,” he says. While Murray says there shouldn’t be too many issues in terms of obtaining a mortgage, difficulties can arise when it comes to insuring listed buildings, especially ones with thatched roofs. Specialist insurers are available in the UK though, and some in Ireland, such as FBD, do have a policy for specialist buildings. Whatever difficulties are involved in buying a protected building do not seem to act as too major a deterrent, he believes. He points to the continued popularity of owning older buildings, and the status they often give the owner.